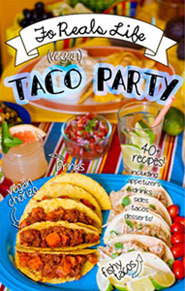 I love me some Mexican food (did you see my Vegan Taco Party booklet?!) Or Tex-Mex really. Vegan Tex-Mex. That's not even really a thing yet but I plan to make it one! It's my favorite type of food to make and eat hands down. I just grew up loving the stuff. And these fajitas?! HOLY FREAKING MOLY were they amazing!!! My family gobbled them right up and I really felt like I should have made more so I would have lots of leftovers. Oh well I can easily make them again. That's another thing that rocks - they are crazy easy to make! They make a super light and refreshing dinner and did I mention crazy easy? Toss the veggies up with some seasoning and roast them. You don't even have to stir the pan around when you roast them! I served them up on my cast iron comal for effect but cooked them on a regular baking sheet. Do whatever works for you! And consider doubling the recipe because you will want some in your burrito or over rice tomorrow for lunch! Preheat your oven to 400 degrees. Line a baking sheet (or two!) with parchment or silpat baking mats. Lay out on your baking sheets in a single layer.